Dipping into Alex Farms’ chicken salad and Clay’s smoked tuna. Alex Farms sells chicken salad out of its shop in Hickory Hill. The "Alex" of Alex Farms is the daughter of Darwin and Kyra Henderson. Kyra says that Alex has always liked animals and the family joke was that she would one day have a farm. But it is son Darrius who proved to be the impetus for this business. As Kyra Henderson explains, Darwin made some chicken salad for his son's fifth grade graduation and it was a big hit. And when it was time for Darrius to go to college, Kyra began to sell the salad at local beauty shops and barber shops to help defray the costs of Darrius' education. The Hendersons then opened up a shop in Hickory Ridge Mall in 2015. "We were very successful in the deadest mall in the city," she says. They moved to their current shop near the Kroger on Riverdale last November. The key to their success, says Henderson, is their smoked, all white-meat chicken they use in the salad. In fact, their motto is, "Where the smoke changes the game." There are no eggs in the salad, and it's not very mayonnaise-y. The secret ingredient, she says, is love. Alex Farms sells three signature sandwiches — chicken salad on toasted white bread; croissant minis with three croissants; and the chicken salad BLT. The addition of bacon is about as fancy as it gets. Eight ounces of the salad are available for $6; 16 ounces, $10.50; and 32 ounces, $20.50. Platters and pans are sold as well, ranging from $35 to $75. On the Alex Farms' logo is a super buff chicken. "Faith is the family's strength," Henderson says. The Hendersons vowed to put this strength to work. First, they would help people eat better. Second, they would help other businesses. To that end, the shop hosts pop-ups and gave Bluff City Crab a leg up. "It's okay to help someone," she says. "We don't have to get it all ourselves." Alex Farms has thrived on word of mouth. Henderson says they have regulars as from far away as Dallas and Atlanta. Henderson says she appreciates all their customers. "If I'm here," she says, "they get a 'thank you' before they are out the door." Clay's Smoked Tuna's journey began in Orange Beach at a place called the Pony. Abrian Clay ordered the Pony's smoked tuna dip, and he thought, "Nobody in Memphis does that." So he decided to do it himself. He bought some ingredients and started working on his recipe. 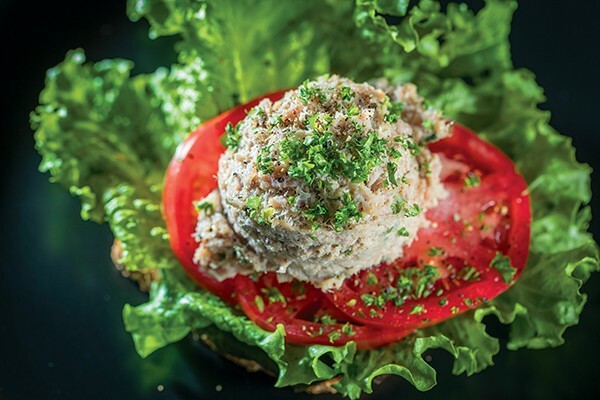 Clay's Smoked Tuna uses rotisserie-smoked yellowfish tuna, which is first marinated in white wine. Clay says, all in all, it's about a nine-hour process. The results, he says, are "to die for." Abrian Clay drops off dip at Curb Market. In fact, according to Clay, his dip has a cult following, which Clay has nurtured over the past three years on social media. Clay says an illustration of this was when he pitched the dip to Curb Market. He was told to give out samples at the store and they would see how it goes. He put out the call and ended up moving $600 worth of product in three hours. Needless to say, the product, along with Clay's Smoked Buffalo Chicken dip, is now sold at Curb Market. You can also find his products at Snappy Sacker Grocery and DeeO's Seafood. Clay works out of a commercial kitchen on North Parkway. 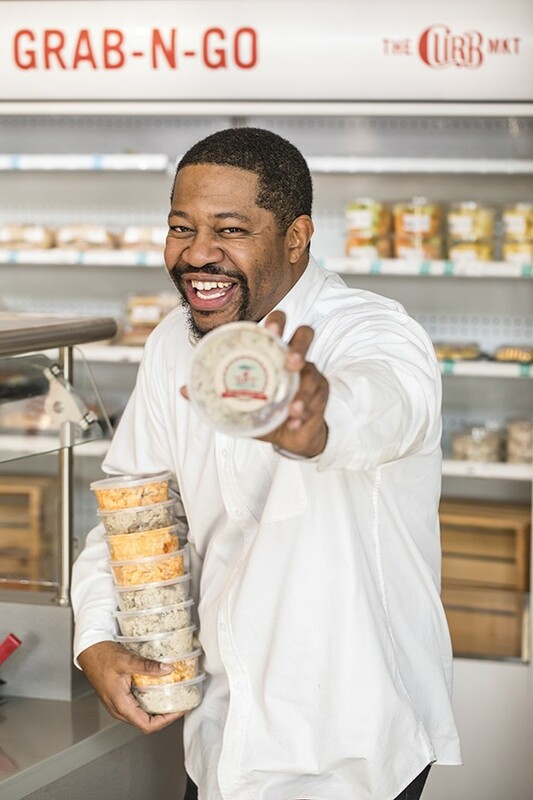 On the weekends, he sells other smoked foods like chicken wings, salmon, lamb and pork chops. Folks can pick up his dip there, too, but he also makes deliveries. Clay says he would like to get into more grocery stores and restaurants. (Those interested can call 901 848-5640.) One thing he's not planning to do is expand his product line. His thinking is pretty much, why mess with perfection? Of his tuna salad, Clay says, "It's a masterpiece."